This year I plan to meditate two times per day. I’m starting with 15 minutes each time. I plan to move up to 30 to 45 minutes each time by the end of the year. During my meditation last night, my spirit guides revealed to me that they had switched their positions for the new year. Carlina, who is usually to my left, moved to my right. Lucé is now on my left, and Alhamba, faithful supporter of my back-body and spine, moved to my front. Maharaji, my longtime spiritual guru, moved to the rear. This change feels quite nice, though I’ll admit it’s taking some time to get used to. Carlina, Lucé, and Alhamba have been in their respective spots since I first learned of them, and I’ve spent many long walks, meditations, runs, and surf-sessions relating to them in particular places. During my meditation, they asked me to pick stones to represent them. With my eyes closed, I did so and put the stones in their correct spots. My guides then told me to pick a stone to represent me and to place it in the middle of them. That felt odd, and I realized that I mostly relate to myself as a void—an empty space moving in space and time alongside matter and characters of substance. One of my jobs this year is to relate to myself as who I am and not as a void or as nothing. 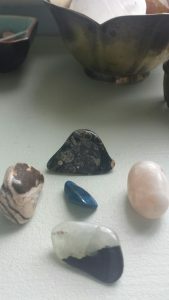 Anyway, after I selected stones for my spirit guides, they started to tell me what they (my guides) represent this year. Carlina represents the Divine Feminine and grounding. Alhamba represents strength, power, and endurance. Lucé represents flexibility and mobility. And Maharaji represents wisdom, support, and encouragement. They all have other representations as well, but those are their primary ones. Maharaji, it feels important to discern, is not so much a spirit guide as a guru and a father. I’ve known about my connection with him for much longer, and he is of a particular lineage. He is connected to my ancestors, my spiritual lineage, and my soul family. While all of my guides know my heart, he is my heart, and he is my home. He has been around in all of my past lives, and he will be there in my future ones. My spirit guides deliver to me wisdom and vision beyond my years and capabilities, and for that, I am grateful. They gracefully walk me through challenges, confusion, and even moments of being lost (literally lost–like, I have no idea where I am or how to get where I’m going lost). They help me experience the depth and breadth of beauty and love around me. They’re pretty amazing. I happen to believe that everyone has spirit guides and if you want to know yours, I know an amazing person who can introduce you.